Cater to different learning styles and compliment your curriculum with a variety of activities to give students the alternative from more traditional learning methods. Read along with audio books, improve listening skills, record voices for pronunciation and testing purposes, and create your own classroom activities. Classroom listening centers lets students read along with an audiobook and allows instructors to record custom activities. 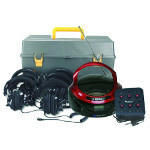 Stereo 6-station jack box with volume control for each station, 6 personal sized headphones with volume control for each ear. Soft leatherette ear cushions and padded headband cover. Portable Stereo top-loading CD Player with AM/FM and Bluetooth Capability. 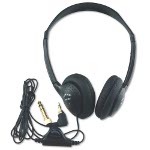 Additional connections include an 1/8 inch (3.5mm) auxiliary jack for connecting to other audio devices like computers or cell phones, plus a 1/8 inch (3.5mm) jack for connecting headphone/earphones. Operates on AC/DC power or 6 “C” sized batteries (not included). 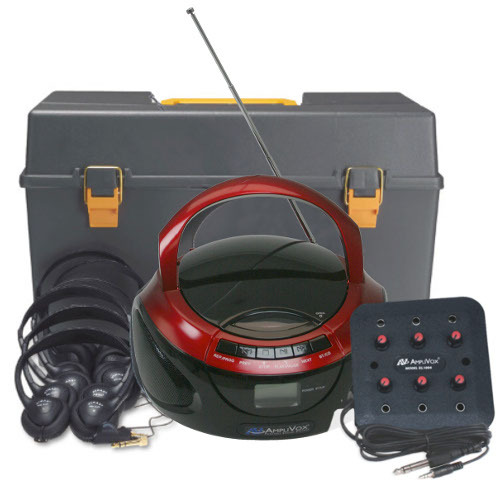 Rugged, durable plastic, lockable carrying case included. 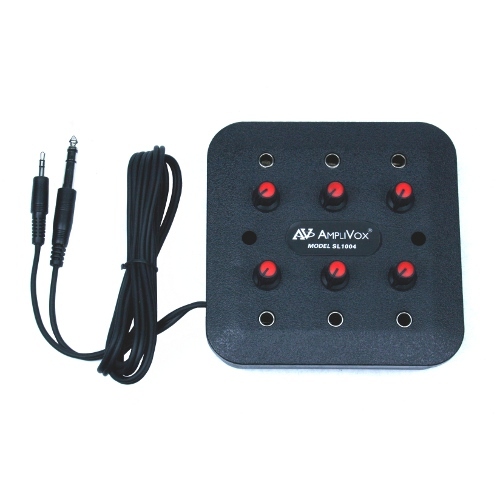 Stereo 6-station jack box with volume control for each station, 6 personal sized headphones with volume control and screw-on ¼” adapter. 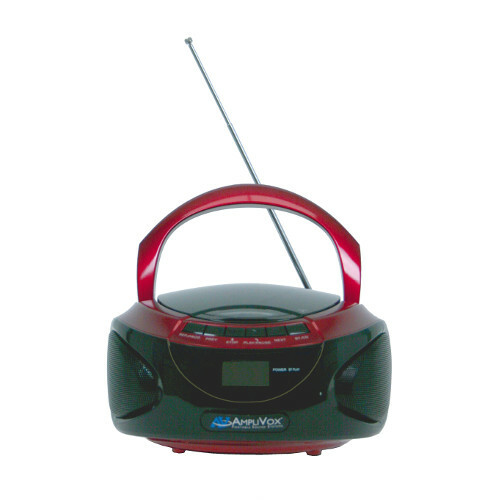 Portable Stereo CD Player with AM/FM Radio and Built-in Bluetooth® for playback of audio from Bluetooth devices. Its modern, futuristic design highlights the top-loading CD player that plays audio CDs and MP3 CDs. Input connector for headphone/earphone and Auxiliary connector for other audio devices. Can also be used as conference speaker for cell phone calls. Includes a top loading cassette deck that both plays and records along with a six station headphone jack box with individual volume controls. 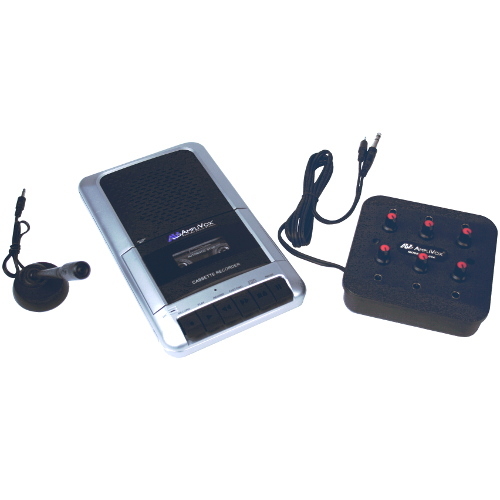 The cassette recorder features easy to use buttons, a one-touch record button, and an automatic voice level control. You can record using the built-in microphone or use the included external microphone with handy desk stand. A headphone jack is included for private listening and for connecting the headphone jack box. 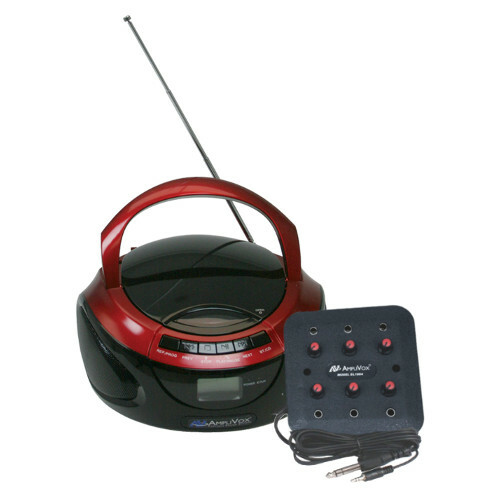 The auxiliary line-in jack allows you to also attach your cell phones, MP3 or other Digital Audio Players to the unit. The SL1039 operates on four (4) x "C" size batteries (not included) or with the AC adaptor (included). Volume control; 6 ft. cord with stereo plug and gold plated ¼-in. screw-in stereo adapter. Impedance: 32 ohms; Freq. Response: 20-25 Hz. 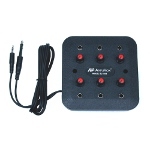 6 stereo headphone jack inputs with individual volume controls. Plugs into a boom box. 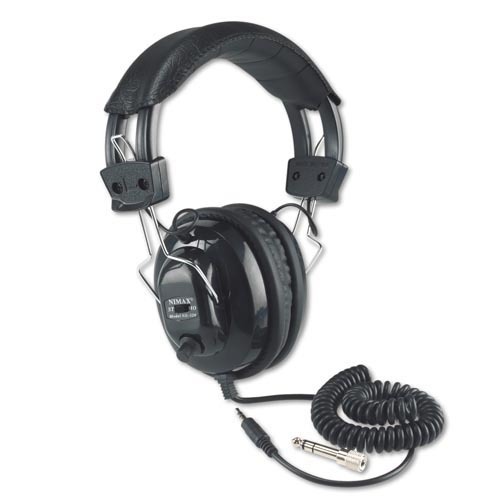 Washable foam filled replaceable leatherette ear cushions; 6 ft. coiled cord; 3.5mm mini plug; ¼-in. snap-on stereo adapter.